One comment I’ve gotten from people is that it’d be lovely to see actual images of tools. Because items may change over time, though, I’d rather have a single place where I describe them (and can update easily), rather than have it scattered across the site. This is obviously an image heavy post, and items are described in detail in the surrounding text. Here are two athames and a boline. 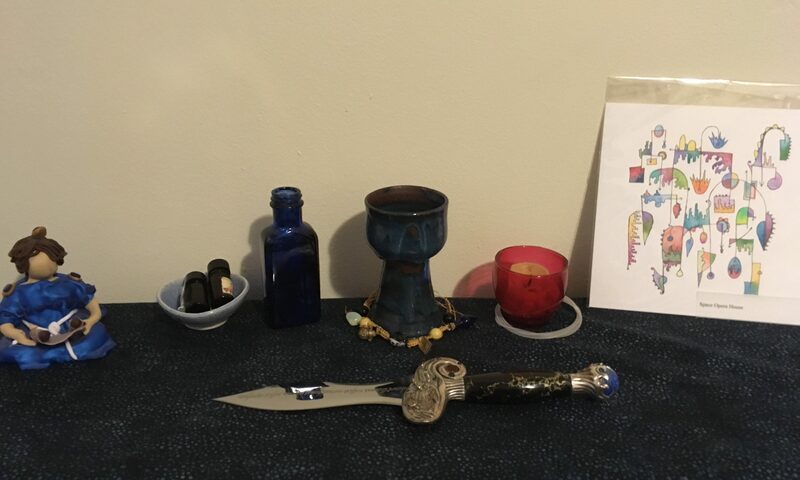 I don’t have my initial athame, which was a very simple eating dagger model (the kind you can get from many Pagan stores for under $25 or so) – most of the time, I used my first two fingers on my projecting hand, instead. The top blade (simple leather grip) was bought at the Minnesota Renaissance Festival in 2007 from a maker called Arms and Armor. (It’s this one). 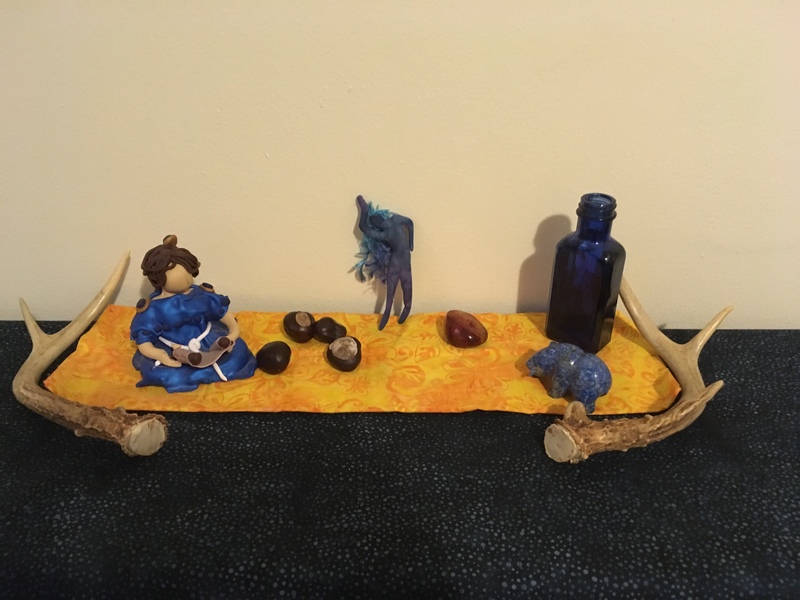 It was my ‘I finished my graduate degree’ present to myself, but while I like some parts of it very much, it’s never quite worked for me as a ritual tool as I’d like. The middle blade is a recent commission, intended to last the rest of my life, thank you. It’s a unique piece (and a glorious piece of art) made by Omega Artworks. They also make non-custom or lightly customised (i.e. 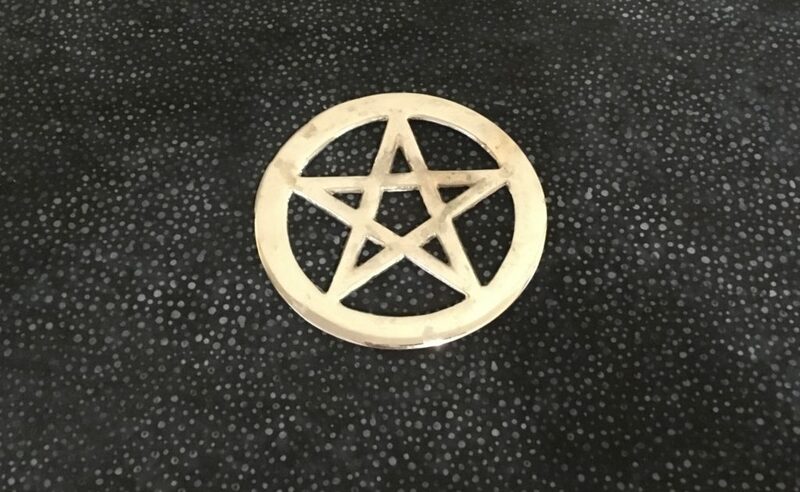 from material and fittings they have available), and I highly recommend their work and their approach to magical tools. You can read more about mine (and see more detailed images). The bottom blade was a gift from a good friend. It was made by a blade maker from the Minnesota Renaissance Festival from quite a long time ago (she was a performer out there long before I met her) and I’m afraid I don’t know the name of the maker. When she divested herself of a lot of her Pagan tools, this came to me, and I’m delighted at how well it matches the athame in feel and workmanship. The handle is antler. As you can see, I like wood for wands. The top two I made myself or they were made as part of training. The top one is yew, and I can’t find my notes currently on what the other is. The next three were made on a lathe. The first and third were gifts, the second was from a shop in Salem, MA. I liked the rustic nature of it, and I’d been looking for something made of apple wood for a while. The last one is, yes, a conductor’s baton – I’m not sure I’d suggest it to anyone who hasn’t at least learned about conducting, but I’ve had this one since my senior year in college conducting class, and it’s been very effective as a magical wand at times. 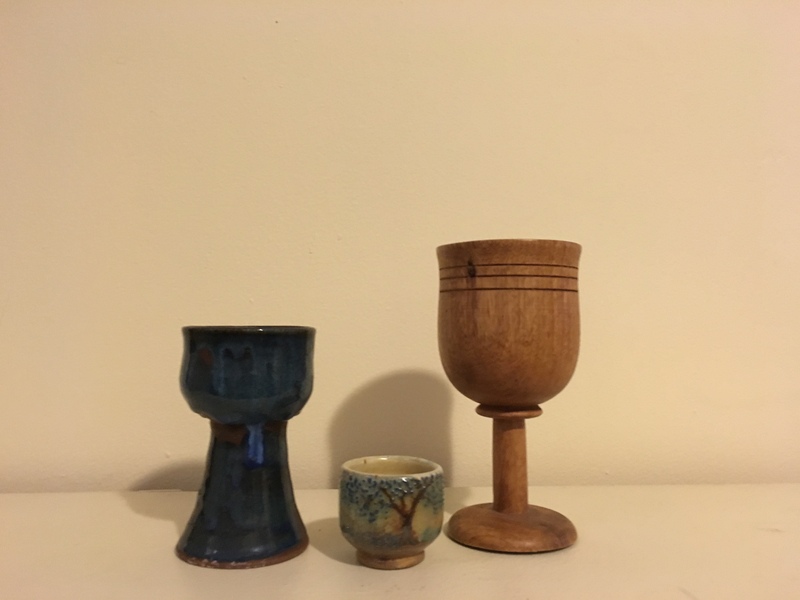 Here are three chalices, with different kinds of use. The one on the left is blue-glazed ceramic, and I love how it feels in my hand. It was handmade by someone I knew online, and we did a swap at one point when I think I was still in my Dedicant year. I’ve kept it ever since. It’s a little small for a group ritual if there’s more than a couple of people, but otherwise it’s great, and it’s very steady and unlikely to tip. The smaller cup in the middle came from a commercial pottery shop that usually does things like mugs for tea. I really loved this little piece, which has a tree done in incised clay and glaze. It’s just big enough for a few swallows, so I often use it if I am currently doing a daily practice that involves a small amount of liquid. 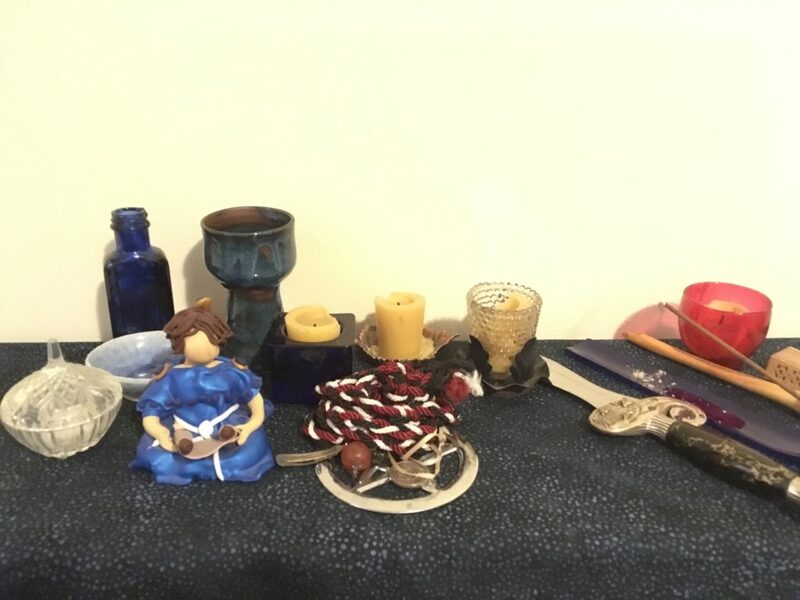 The one on the right is wood, and thus very practical if I want to take altar items somewhere, since it’s hard to damage. It also has a nice feel in the hand. I find it a little prone to tipping if it’s not on a steady surface. I’ve had this since, I think, college, when I was doing Society for Creative Anachronism, but a number of Renaissance Festivals, medieval faires, re-enactment groups, and other similar events will have wooden items like this. My pentacle is probably my most boring altar tool – this came from a Pagan store, it’s plain silver metal. It is, however, nicely flat to put things on. Salt dish, small dish for mixing water and salt, blue glass bottle with water. Hypatia statue (self-made), ancestor of profession. Small bowl with perfume for self-anointing. Blue glass bottle with water. Chalice, with a bracelet with particular personal meaning around the base. Tradition-specific candle, with a harpstring coiled around the base. Horse chestnuts, which are one of the signs of fall to me, and also (unlike a lot of natural plant objects) keep for a very long time. A lapis bear with a fish in its mouth. 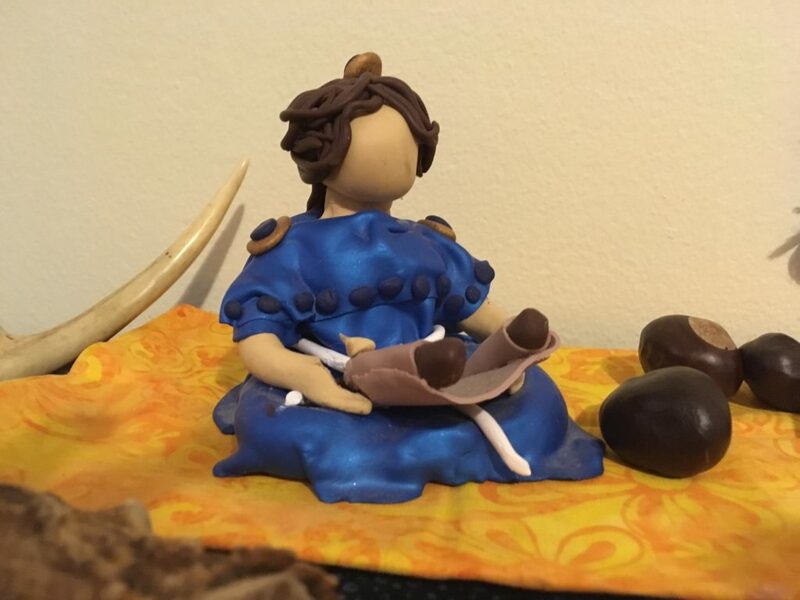 Here’s a better shot of Hypatia – as you can see in the closeup, her thumb has broken off over time, and I should make a new one. You can see I didn’t try to do detailing outside of my abilities – no face, no eyes, and she’s sitting crosslegged to provide a solid base and avoid my having to do anything with feet or legs. I’ve found I rather like the effect, though. I’ve done similar figures for long-term prosperity workings, too.